I woke up yesterday with a hankering for quesadillas. I rarely order them when I go to Mexican restaurants but I had them a few weeks ago at Superior with some friends and I enjoyed them more than I thought. I will be honest and say the best quesadillas I have ever had were made by my best friend Lolly when we were in grad school. She made it look so easy and they were absolutely delicious but I yesterday I was stumped about how to begin to make quesadillas…crazy I know. Of course I looked on pinterest and I found some recipes that looked good, but many were for bbq chicken quesadillas and other variations. I was looking for simple, plain Jane quesadillas, increasing the chances that my Cajun bebes might eat them. So that ruled out onions, tomatoes, green chiles or peppers. Also, lately I am trying to challenge myself to cook with the ingredients I have some days instead of running out to the store every day. Well I am happy to say mission accomplished. 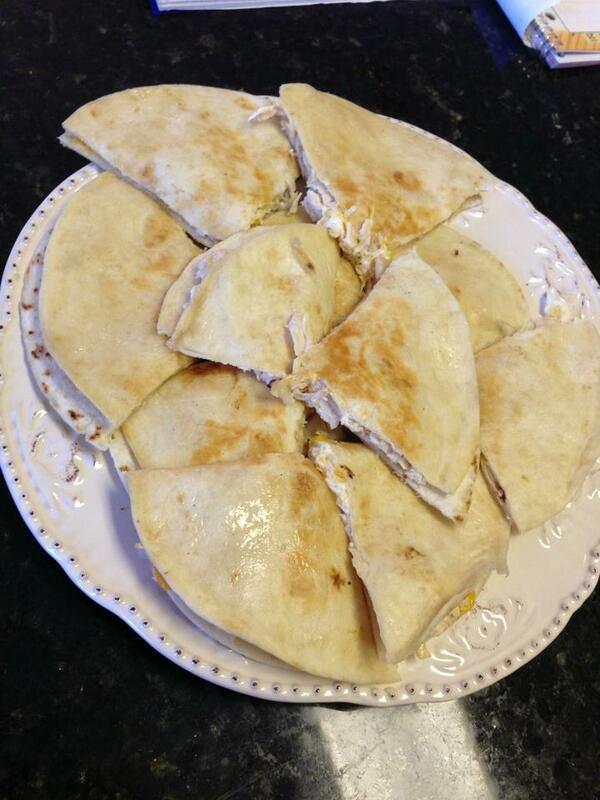 These quesadillas were easy to throw together, the kids loved them and were delicious. Allow cream cheese to soften in a medium size bowl. Shred your cheese and add that to softened cream cheese. Stir in shredded cooked chicken. Over medium heat, warm up a medium sized skillet. Butter one side of each tortilla. Lay one tortilla in warmed skillet, buttered side down. spread some of your chicken filling (about 1/4 cup) over that tortilla and then top with another tortilla, this time buttered side up. Cook over medium heat (adjust heat as necessary as every stove cooks differently) until one side of quesadilla is lightly browned (about 2-3 minutes) and then use a spatula to flip the quesadilla. Do the same thing with each quesadilla until they are all lightly browned on each side. Your filling will warm and spread out some so don’t worry about covering the bottom tortilla with filling. use a pizza cutter to cut into 4 parts. Serve with pico, guacamole, and sour cream. YUMMY!!!! Where do you get the crazy jane salt? Sounds interesting! I got it at Kroger. I have seen it at brookshires too though.